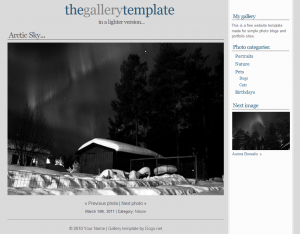 Two lighter versions of the Gallery template have been released, made on request from one of my friends who wants to use it for a simple HTML/jQuery-based photo page. The new versions have a lighter background and a different colorscheme. The original Gallery template has become one of the most popular downloads on this site, and also one of the templates that I have got most suggestions for. I will make more modifications for it, as well as extending the image gallery tutorial during the next couple of weeks. Thanks again to Steve for the original design!